We’ve built numerous indoor-outdoor kitchens before, and we noticed a trend. All our clients wanted a seamless connection between the two spaces. The kitchen is the heart of the house. When you merge indoor and outdoor areas to create one kitchen, you create a truly functional space for cooking and entertaining. READ: 8 kitchen design ideas that are perfect for home cooks. Also, we’re lucky to have a lovely climate that enables us to have livable spaces outdoors. Having an alfresco kitchen with an all-weather entertaining area fits our lifestyle. We like to bring nature into our homes. Extend your kitchen bench into your outdoor space. The counter/bench is the centre of all activities in the kitchen. It’s where we prepare, cook, serve, and (sometimes) eat the food. If your space and budget permits, consider having extra storage and a built-in barbecue grill on your alfresco kitchen. Think about having a second sink, range, or fridge too. (We find this useful in multi-generational homes). Separate the areas using glazed doors and windows. 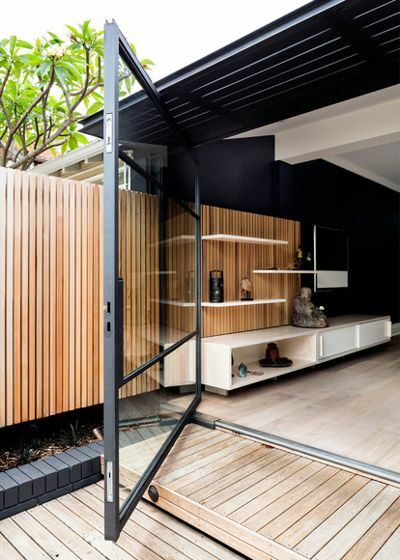 Whether closed or open, glazed bi-fold, sliding or stacker doors and windows visually connect the two areas. Go for varieties with slimmer door frames. Without the bulky frames, you enjoy a seamless view and bountiful natural lighting. Keep your glazed doors and windows open during the summer months to avoid unwanted heat gain and to allow an uninterrupted airflow in-and-out of the kitchen. 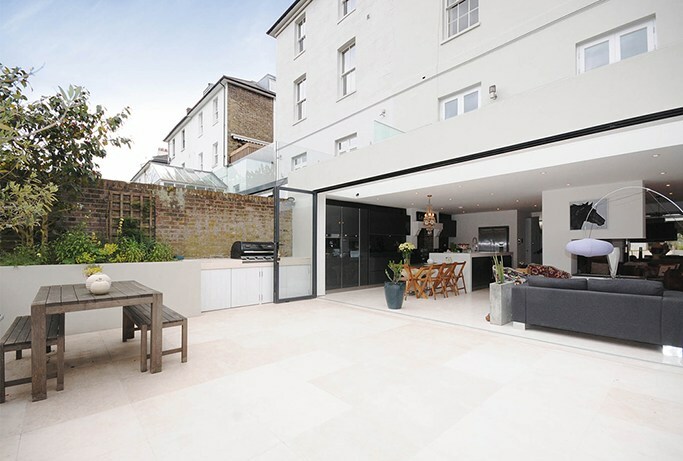 Choose the right external glazed doors for your indoor-outdoor kitchen. Use complementary building materials to unify the two areas. The type of materials and the finishes used in your indoor-outdoor kitchen help visually connect the two areas. If you’re planning an extended bench, consider building the interior and exterior side from the same materials. Use weather-proof materials and surfaces. We highly recommend using reconstituted stone tiles, concrete, and stainless steel on your extended bench. Think about your floors too. It covers the largest area in the space and strongly links the indoor and outdoor areas. If you use the same flooring inside and outside, you seamlessly integrate both areas. You totally blurred their boundaries!. One way to do it is by using the same tiles but in different finishes. One tile needs to be indoor rated while the other must suit exterior application. Either way, both tiles must not feel slippery when wet. A lot of work happens in the kitchen. You don’t want to slip, fall, and hurt yourself. 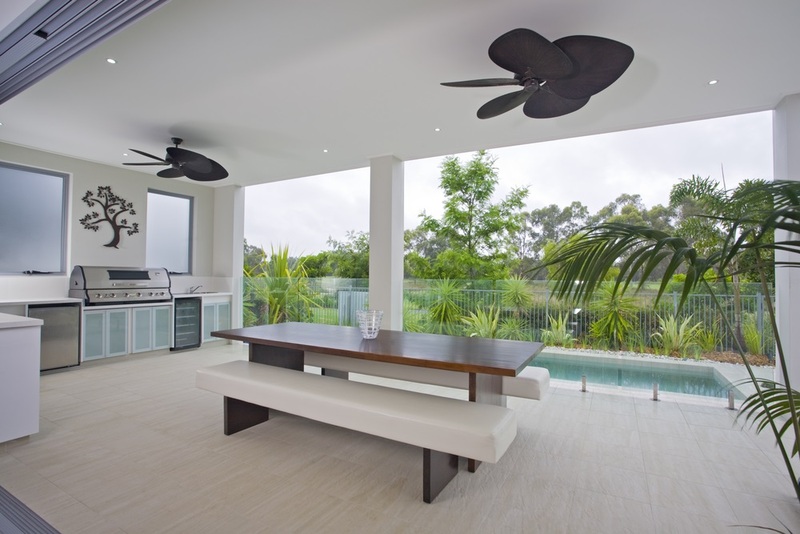 Read this before you lay timber floors on your indoor-outdoor spaces. Lastly, think of practical heating and cooling methods. You can enjoy indoor-outdoor kitchens and entertainment areas 24/7, regardless of the season, when you have a way to control the temperature. When you experience a cold winter season, consider using a portable fire pit or gas heater to warm up your alfresco area. Store it in a cool and dry place when not in use. Permanent features like ceiling radiator panels work too. Go for variants that are unnoticeable on your ceiling. For the warmer months, we recommend using ceiling fans. These will redirect fresh air towards you and inside the house. Set it above the outdoor dining and entertainment areas. Find the best architects in Sydney. Want a kitchen that opens up to the elements? Time to invest nearly as much in your outdoor kitchen as you do inside.